Whether you want to believe it or not, setting sprays are definitely a necessary step in any lady (or man's) makeup routine. For me, they really do assist with increasing the longevity of your makeup and also reduce the chances of makeup transfer when you're using your phone or touching your face. For those that may not be too familiar with setting sprays, I've broken down some of my favourite ones and given you lots of options and price tags to choose from. 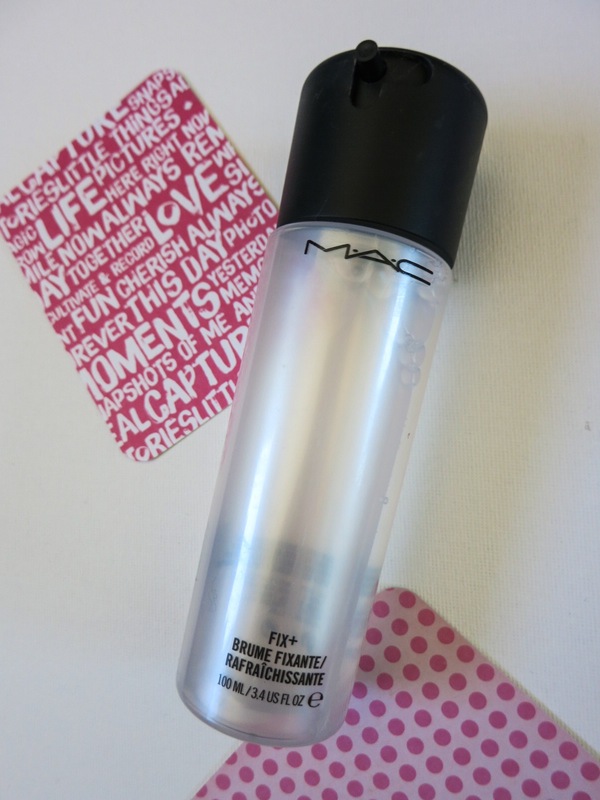 Setting sprays generally come in a pump bottle for easy touch-ups and are available through many different makeup brands, including mid, high-end and drugstore. Some sprays are more of a moisturising, spritz of solution that leave you feeling refreshed. Others, are definitely more focused on controlling oil and making sure that your makeup doesn't budge all day. Generally for each setting spray, the procedure is to hold the bottle 8"–10" away from your face and mist face 2–4 times, in an "X" or "T" formation. 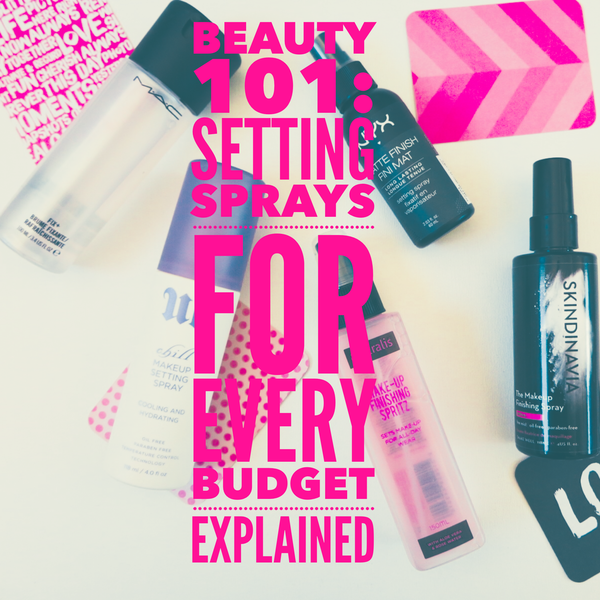 Each setting spray has it's place and I'll be going through them with you today! 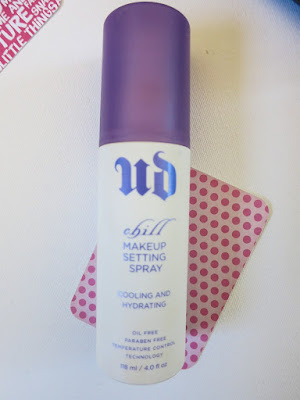 This setting spray from Urban Decay is designed for dry to combination skin types and boasts extending your makeup wear for up to twelve hours. The cutting-edge technology of this spray is supposed to lower the temperature of your skin to prevent makeup from slipping and sliding off your face. It feels cooling and refreshing on the skin and I find it really does assist my makeup to stay in place all day. That being said, this will also be determined by your primer and foundation and a setting spray is only one extra step to increasing the longevity of your makeup. One of the reasons I'm writing this post is often people believe that Fix + is a great makeup setting spray for keeping makeup on all day. I honestly find it to be more aimed at refreshing the face and providing a boost of moisture for the skin. It doesn't do anything to keep my makeup in place. 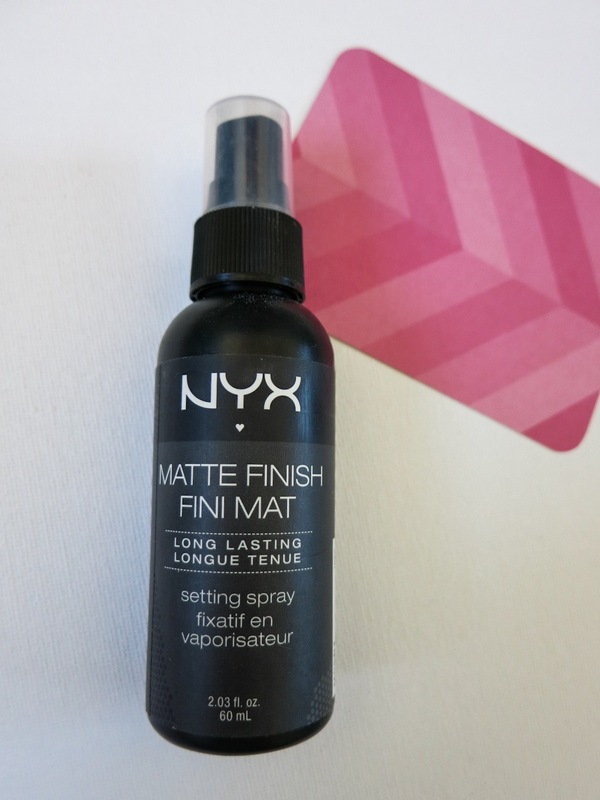 I generally use this spray to apply loose pigments by placing a spritz on my makeup brush or to dampen my beauty blender. It can also be used to assist in creating a smooth surface for makeup application so you could apply it right after your primer. I wouldn't suggest this one for a sweaty night of dancing because you will be very disappointed! One of the best budget setting sprays I've come across is this lovely option from NYX. Also available in a Dewy Finish, this setting spray has a formula that rivals some of the higher end brands but is extremely affordable. I find this setting spray is great at reducing oil in my t-zone and keeps my face looking matte and avoiding that cakey look. I'd highly recommend this setting spray for anyone who is looking for something long-lasting but is also on a budget. This one is also one of the few travel friendly options since it comes in at just 60ml so you can take it with you on your carry on luggage. Different name, same concept. This is also a drugstore option, however I find the formula is more consistent with MAC Fix + and it doesn't do much for me in the longevity department. 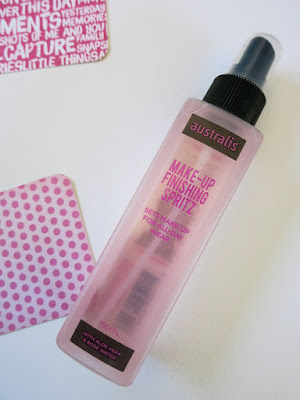 This setting spray from Australis, claims to provide a barrier against temperature and environmental changes however I find it is a very wet formula that doesn't really set, but just provides that burst of hydration you would expect from a facial mist. It smells nice since it contains rose water and aloe vera for hydration. Nice to keep at your desk at work for a refreshing burst at 3pm, but not one that I would reach for when I'm going out in 30 degree weather. I thought I'd save the best for last because this product is by far my favourite out of all of these! The Urban Decay setting sprays are made in exclusive partnership with Skindinavia, so upon further research I realized that Skindinavia offer their own range of setting sprays!!! (thank-you makeup gods). This setting spray is designed to keep your makeup in place all day and throughout the night. The bridal version can be used at anytime of course but was given it's name since it is tear and moisture resistant - so you can even shed a tear but your makeup will still look amazing! I know what I will be using for my upcoming wedding! I have worn this baby throughout big night's of dinner, drinks, dancing and in australia's humid summer and it does not budge. It has even assisted my makeup to last throughout swimming. When you apply this to your face, you can feel your makeup setting but it doesn't tighten or feel uncomfortable on the skin. This is my top pick for you if budget is not an issue.The bottle will also last you a long time since it contains 118ml and you only need a few sprays and you are good to go. I also own this one in a mini travel bottle (20ml) since I cannot be without it so I just re-fill the travel bottle when I go on holidays. 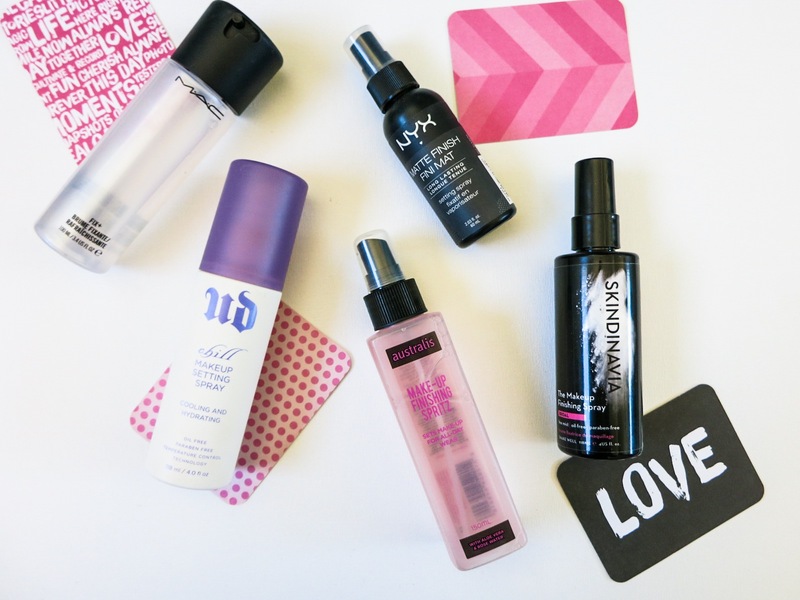 Well, that's my setting spray roundup! I hope you've learned a few things and as always, please keep in mind that this is just my experience with each product and many people may disagree with me or have different favourites! Do you use a setting spray? Which one is your favourite? I'm joining in Ingrid's Monday Blogger Link up party! To read a bunch of fun beauty blogs in one spot click right here!